Dixie Dixon was one of the many bright-eyed young girls who left behind small town life in search of fame and fortune as a vaudeville performer, but unfortunately her suspicious death instead of her stage presence became her legacy. Miss Dixon was born Mabel F. Dixon in Danville, Virginia to Charles and Mary Dixon in 1897 or 1898. Charles, a brakeman on the Southern Railroad, died in 1906 in a freight train accident/incident. Mary remarried James Terrell sometime during the next two years. Mabel, who adopted the stage name of Dixie, always exhibited a flair for the stage and performed at Danville’s “Majestic” before leaving home around the age of 20. She first worked in Atlantic City and eventually landed in New York. Around 1913 while performing in a play she met a naval officer, R.M. Bliss, who was stationed in Rhode Island. The couple later married and moved to Ohio. Rodney, already a man of means, would eventually become even wealthier at a Chicago brokerage. Mabel and Rodney were living in Cuyahog, Ohio at the time of the 1920 census with Mabel’s occupation listed as “none.” During the marriage Mabel performed less frequently, which could have caused her to be unhappy. For the last two years of the marriage Mabel and Rodney lived apart. Some believed that Mabel’s free spirit clashed with the conservative Bliss family, leading to their separation. At the time of her death on January 22, 1922 Mabel had been living in New York’s Buckingham Hotel for about three weeks. Over the Christmas holiday visited the Terrells in Danville. When she left she mentioned that she had plans in New York with a girl friend from the Cleveland theater. This friend could have been another Danville native, Carrie Hodge Hill, who was also living in New York. It’s also possible that Mabel’s rendezvous was with a different person altogether. This account of what happened on the evening of Saturday, January 21 is from a chauffeur named Martin Ryan who spent two weeks in jail under initial suspicion that he had murdered Mabel. The two met at Fifth Avenue and Fiftieth Street after she left her hotel & hailed his cab. Mabel allegedly asked him to take her to an uptown address so that she could score some drugs. He couldn’t remember the address upon questioning, but claimed they took a cab to the house where three men came out with a package for Mabel. She claimed it was “the wrong stuff” but took some of whatever it was anyway. He drove Mabel to several cabarets before she passed out in the cab. Martin claimed that he rode around with the unconscious woman in the car for four hours before he alerted anyone to her condition. He finally drove her to a drug store, where a clerk urged him to seek medical attention. Mabel died in Harlem Hospital of what was initially believed to be a morphine overdose. The article “Danville Girl is Drugged in New York Taxi, Dead” on Jan. 23 claimed that before her death she was able to give a statement to NY detectives implicating Martin Ryan in an assault. This information conflicts with a statement in June 9, 1922’s article which says that Mabel died without “shedding any light on the case.” Because her death was attributed to an overdose Martin was released in early February, an act which angered the Terrells. They didn’t take very kindly to the news that their precious loved one had died of a drug overdose and insisted that it was a homicide. The family hired lawyers to investigate their suspicions. While they vehemently denied that Mabel used drugs, one Danville druggist told authorities that he had refused her the sale of an opiate on one occasion. Mabel’s body was autopsied three times. The family wasn’t convinced that the first autopsy was thorough so they arranged with Danville doctors to have her vital organs sent for further chemical analysis. Two Danville doctors who examined her body claimed she had been “brutally murdered.” Mabel’s nose was broken, her body bruised, and one of her fingers was torn. These were believed to be injuries sustained while trying to defend herself. Mr. Terrell hired lawyer Harry Berman to push the reopening of investigation in New York, which had pretty much been dropped by the homicide squad. By February 13 Mr. Berman announced that the third autopsy revealed that her death was due to “heroin poisoning” and that he learned that there were two other men in the taxi with Mabel and Martin the night she died. Berman had uncovered the name of one of the men as well as the fact that Martin’s clothing from that night was blood-stained. These new developments prompted NYPD to reopen the case, even though Berman felt that police were under duress to let the matter go without further investigation. After Mabel’s death Rodney Bliss mysteriously vanished, without coming to Mabel’s funeral or to collect her personal items from the New York hotel. Efforts to locate him at his home or at any of the residences owned by his wealthy family were futile. In March it was revealed that someone representing the Royal Canadian Mounted Police solicited Mabel’s help in busting an international drug peddling ring in which she was involved. Showgirls were frequently used to carry drugs across borders. One theory was that Mabel died as part of a revenge plot by the drug gang, who had also planned to kill at least three other women who might have turned against them. Mabel was believed to have received death threats from this gang. 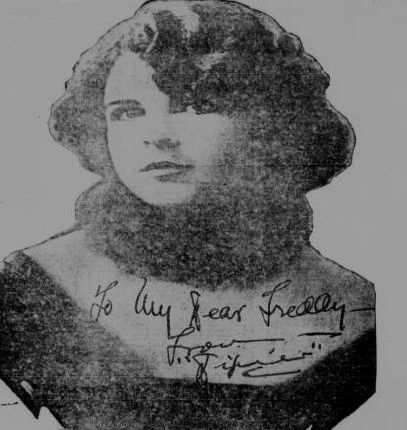 Letters written to Mabel mailed from somewhere in Ohio signed by a “Margaret” urged her to meet with her in New York, but Berman believed that the letters were actually sent by or on Rodney’s behalf. The March 13, 1922 article, “Another Showgirl Victim of Drug Smugglers” suggests that NH native Dorothy Wardell (perhaps spelled Wardwell) had recently died returning from Montreal of a similar drug overdose and could be tied to the same drug ring possibly linked to Mabel’s death. The last article that I found related to this case was from January 22, 1953, on the 31st anniversary of Mabel’s death: “‘Dixie’ Dixon’s Death Still Unsolved After 31 Years: Beauteous Danville Blonde Was Poisoned in N.Y. Taxicab“. There we learn that nothing solid came of Mr. Berman’s inquiries and that trying to put together the pieces of the case from news articles was impeded by most of the news archives being burned down in a fire of the filing room. It’s impossible to say whether or not Mabel died at the hands of a foe, an angered spouse, or if she simply succumbed to the perils involved with using the drugs that helped her escape reality. Perhaps if she had died in modern times this would have been a case that could have ended with an answer rather than a 92-year-old question mark. On my most recent visit to Green Hill, I located Mabel’s father’s grave in the Dixon square, L-37. Mabel’s grave is supposed to be in Section K&L #’s 36 & 37. I was unable to find a headstone for her. “Another Showgirl Victim of Drug Smugglers.” The Bee 14 March 1922. New York Taxicab.” The Bee 22 Jan. 1953: 6. “Expect Arrests in Two Drug Murders.” The Bee 15 March 1922. “Last Letter From Mrs. Bliss Shows an Estrangement.” The Bee 25 Jan. 1922: 1, 3. “Mabel Dixon Was Killed by Drug Smuggers’ Ring.” The Bee 24 Feb. 1922: 1. “More Sidelight in Girl’s Death.” The Bee 1 March 1922: 1. “Mrs. Rodney Bliss is Laid to Rest.” The Bee 27 Jan. 1922: 1. “New York Attorney Here in Dixon Case.” The Bee 9 June 1923: 1. “Ryan Cleared of Murdering Girl.” The Bee 7 Feb. 1922: 1. “The Sensational Sequel to the Drugging of Dixie Dixon.” The Morning Tulsa 2 July 1922. “Try To Locate Girl’s Husband.” The Bee 24 Jan. 1922: 3. “Two Men in Taxi with Miss Dixon When Taken Ill. The Bee 13 Feb. 1922: 1.